It wasn’t easy locating Tadg’s Gastro Pub. Looking on the internet, we found Tadg’s Irish Pub and then had found out that it had closed. Luckily we stumbled upon the website only to find it hadn’t been updated since Christmas. Not the most auspicious of starts. Then, purely by chance, the Facebook page popped up so we quickly sent a message to them asking what beers were going to be on. Nothing. For two days. Suddenly a message popped up, “We will update the beers tomorrow”, which came and then nothing. We’d pretty much given up hope until we bumped into some foreigners in Kyoto who told us that, yes, the bar is open, and yes, they do serve Japanese craft beer. JJ Abrams – check out the lens flare. This is their second location after moving from Tadg’s Irish Bar and Restaurant. I guess there wasn’t much demand for Guinness and Kilkenny in Kyoto. It has been redesigned with the aim of promoting Japanese craft beer – so much so that all kegs are 10L to ensure quick turnover and freshness, even though most craft beer breweries ship 10L kegs as standard. We turned up at about 8:30pm on a Saturday night, much later than we had planned but we had spent too much time at Beer Komachi with the owners chatting and laughing. As soon as we sat down we were told that the chef was finishing up for the night and last orders of food were due. Talk about pressure. A plate of meat and beer were swiftly ordered though the waitress did try to push us to eat the fish and chips. 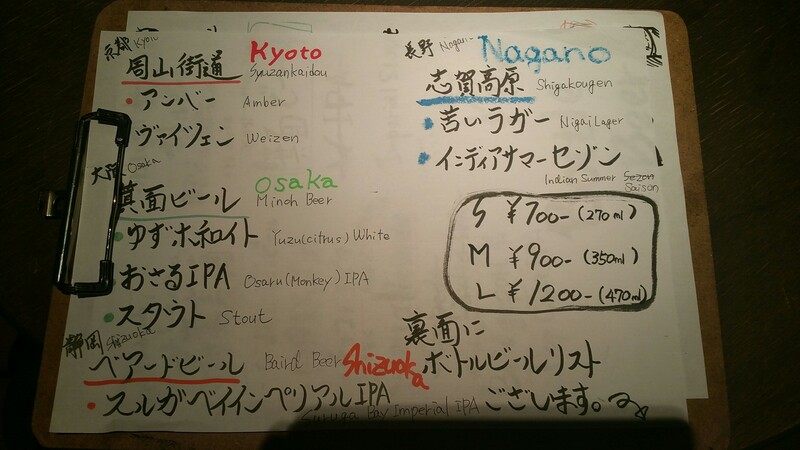 Beer wise, there were eight taps of Japanese craft beer with three different sizes available, the small (270ml) at ¥700. medium (350ml) at ¥900, and large (470ml) at ¥1200. Thankfully, all prices include tax and there wasn’t a table charge else we would have left at these prices. It was great to see some local Kyoto beers on tap though seeing such a swath of taps dedicated to so few breweries was strange. We have no problem with any brewery on the list but after experiencing a wide range of breweries in the various bars, it was a slight disappointment. Minoh Yuzu White – a spicy weizen. Kyoto Amber Ale. Woody and smokey. With such a narrow choice, we plumped for the Minoh Yuzu White as the last time we tried to have it H@bit it was sold out, and the bottles were hard to come by. The spicy yuzu citrus kick paired well with typical weizen pungency and went down well. We tried to order some of the Kyoto range but the weizen had run out so we ended up with Kyoto Craft Hanamachi Amber Ale. A nice light amber taste though it was pretty bland compared to the Yuzu White. Mixed meat special – not a doner kebab though. 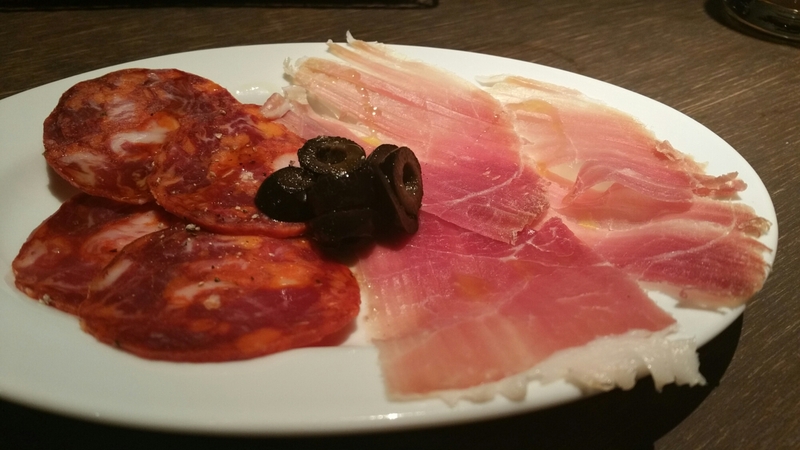 We didn’t get much time with the food menu as the waitress was a tad pushy so we plumped for the meat plate. As nice as it was, it would have gone down well with some other sides such as bread or cheese but that was gone. The menu at Tadg’s Gastro Pub had the basic pub food, such as some pizzas, eda mame and other Japanese standards so we weren’t too upset about not missing out on it. With so much competition in the area, Tadg’s Gastro Pub has its job cut out to succeed. It isn’t cheap and the food is not what you would expect from a regular pub but it is a nice place to relax with some friends. 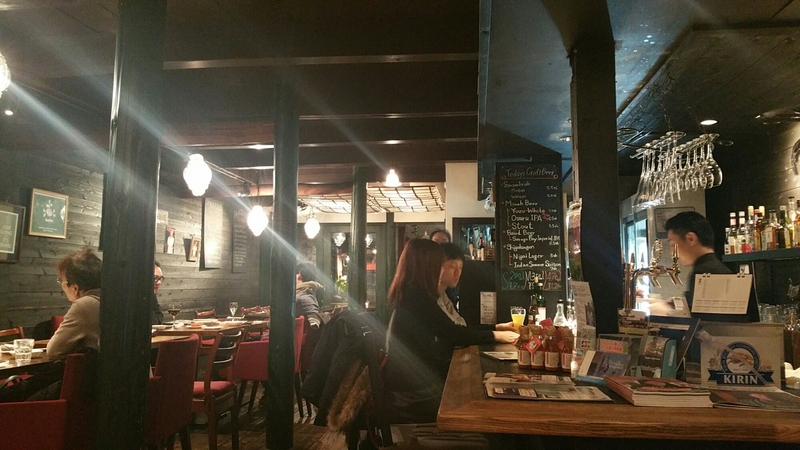 The nearest station to Tadg’s Gastro Pub is Kyoto Shiyakushomae on the Tozai line. Hi Rob, sorry you did not have a good experience on the night and am disappointed reading your review after all the very positive ones we got from the likes of Yelp, TripAdvisor etc. No we didn’t rise from the ashes, we moved location, my original bar had 25 craft beers on tap and no Kilkenny to be seen. Working as a chef/restaurant/Bar owner for over 30 years, I would not consider the food I do, standard Japanese Pub food. 48hr Lamb chop with roasted garlic potatoes, Eggplant fritters and red wine and shallot sauce? Line caught sustainable Cod in Beer and vodka batter with Baked Potato fries? or Chicken pot pie , white wine, home smoked bacon, mushrooms and cream? Chicken Catalan, chicken in red wine ,sweet peppers onions ,garlic herb oil and Chorizo with rosemary potatoes. yes we have edamame! does it not go as a good beer snack.There are over 27 items on the menu and I NEVER have rushed a customer if anything I have always tried to accommodate even after last orders. Don’t know how you got the idea I was leaving the kitchen at 8.30? Thanks for the comment. I wouldn’t say it was a bad experience at all as I found the bar to be relaxing and a enjoyed chatting with some friends I bumped in there. With regards to the food, it seems to have been a few crossed wires then going on as I was looking forward to a decent meal but was adamantly told in English that 8:30 was the cut off without even getting to see a more detailed menu. I hope to get down to Kyoto again soon and try some of the 48hour lamp chop along with beer and vodka batter fish and chips. hanks for your prompt reply Rob, I would be interested to know what member of staff told you that? that is unacceptable, look forward to seeing when you get to Kyoto. Could you tell me what date it was? I will be discrete. Hi Tadg, if you could email rob@beertengoku.com we’ll get in touch with you.